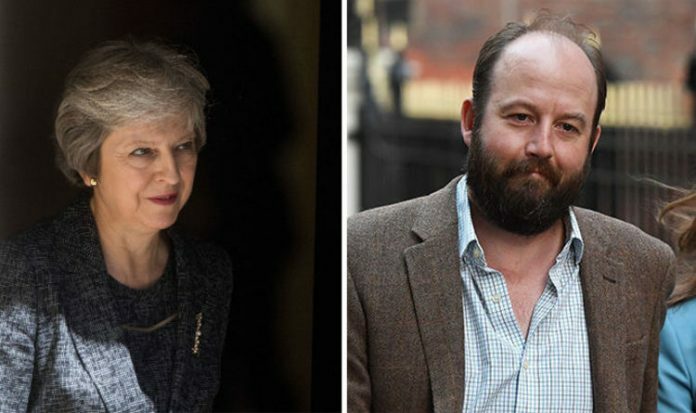 THERESA MAY’s Chequers deal has been attacked by one of her closest advisors, Nick Timothy, who served as her chief of staff from when she took office until the disastrous 2017 general election. In an article for the Daily Telegraph, Mr Timothy asserted his belief the Chequers deal will be rejected by Brussels and could lead to a very bad deal for the UK. He said: “Chequers was never going to be acceptable to the EU, because it drives a coach and horse through its core principles. Mr Timothy claimed the EU will say the UK needs to make further concessions, such as freedom of movement and annual payments to Brussels – or face a no-deal Brexit. He said: “If the Government concedes these demands, Britain will, legally speaking, leave the EU next March, but we will be under its control and find ourselves in the worst of both worlds. Mrs May’s old advisor expressed his concern she will plough on with her plan, even if negotiations are working against her. His comments were in reference to the resignations of Brexit Secretary David Davis and Foreign Secretary Boris Johnson as a result of her Chequers deal, as well as the considerable amount of cross-party criticism she faced. Mr Timothy is a controversial figure, who resigned from his position as Mrs May’s joint chief of staff in June 2017, along with Fiona Hill. It is said Conservative MPs gave the Prime Minister an ultimatum – sack Mr Timothy and Ms Hill or face a leadership challenge. In his latest intervention in the media, he suggested a way forward: instead of a Chequers Minus or no-deal Brexit, the Government should aim for a more conventional trade deal such as the one outlined in David Davis’ white paper – a ‘Canada plus’ deal. Mr Timothy also had some disparaging words for the EU, citing examples of populists and far-right politicians gaining power across the continent. He said: “The liberal Europe dear to British Remainers is dying.